Transmission Date : Aug. 11 2013 Welcome aboard the fully functional SUPERHERO SATELLITE! After a month of darkness the Satellite is back in Orbit and back on its mission to trace retro transmissions. I am proud to relaunch with something near and dear to a lot of peoples hearts! Saturday Morning Cartoons! Heroes to the new Time Travel capsules we are going all the way back to 1970..of course bright and early on a Saturday morning! Pre 70s cartoons were breaking new ground with each episode and show. 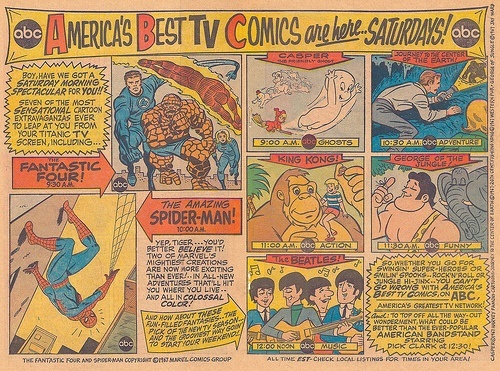 Comic related cartoons ruled the airways as the classic 69 Spiderman show spun its webs on audiences preparing a generation of “Amazing” Saturday Mornings to come! 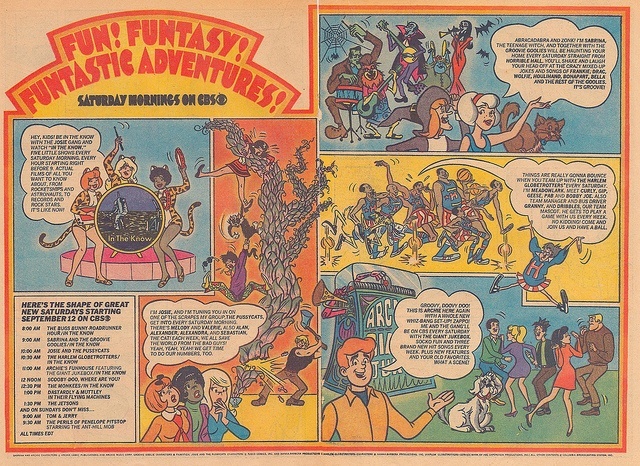 Fantastic Four and even some of the Harvey Comics characters like Casper The Ghost and Wendy The Witch debuted on TV for young eyes to watch! 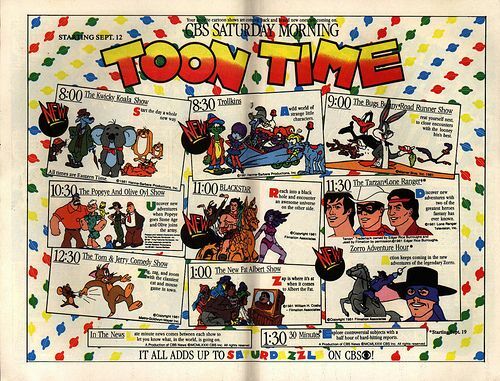 As we headed into the early 70s Cartoons like Archies Funhouse, Tom and Jerry The Bugs Bunny Road Runner show, The Jetsons ,and many others established Saturday Morning as the start of something special! 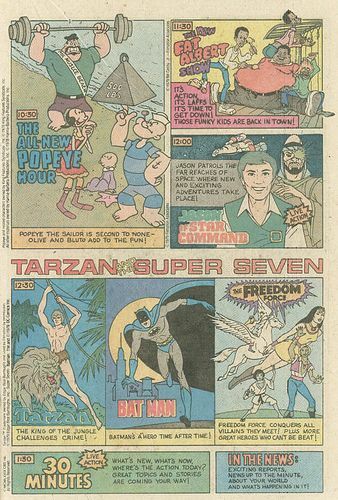 The 70s would get much more loaded in content for kids and much weirder! 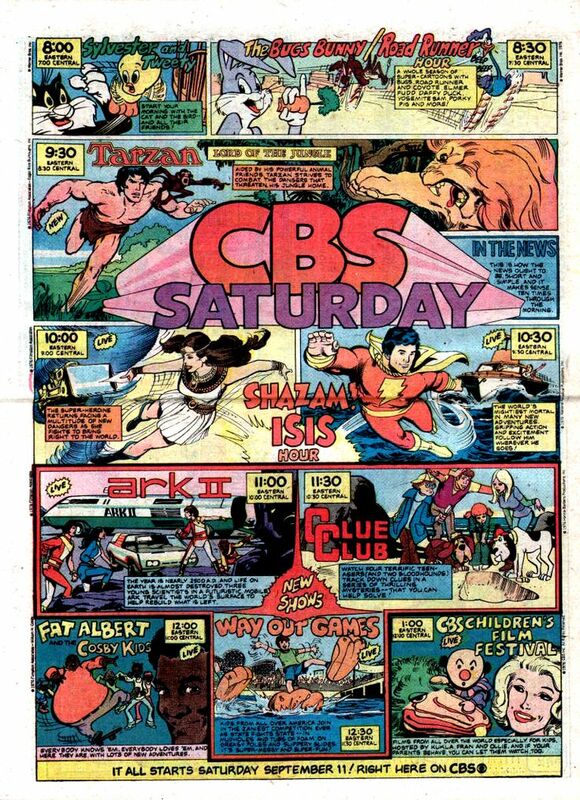 As the mid 70s came and passed staples of Saturday Mornings like Scooby Doo Where Are You, were joined by short lived classic shows like Star Trek The animated Series, even some crazy live action shows like Shazam brightened television screens across america. New Stars roared onto the screens of the 70s with such classics as Tarzan and Isis. Live action was still alive and well on Saturday Mornings as kids flocked to the big three networks for their weekend fix! Unique forgotten shows like The Young Sentinels, and “I am The Greatest: The Adventures of Muhammed Ali” graced the airwaves for short runs along with a barrage of live action shows like Ark 2, and Jason Of Star Command! Saturday Mornings were not yet at its peak years but the beginnings of legendary characters like Spider Woman, The Thing, Scooby-Doo and Scrappy-Doo, Plastic Man and of course the Caped Crusader himself Batman! Of course we could not talk about the 70s and cartoons without mentioning SUPER FRIENDS!! Super Friends was the Pinnacle of Saturday Mornings! Plenty of shows were being experimented with..many have been forgotten into obscurity..but the SuperHero Satellite brings em right back! CBS especially ran an obscure relatively forgotten line up featuring The Super Seven..it has to be seen to be believed! 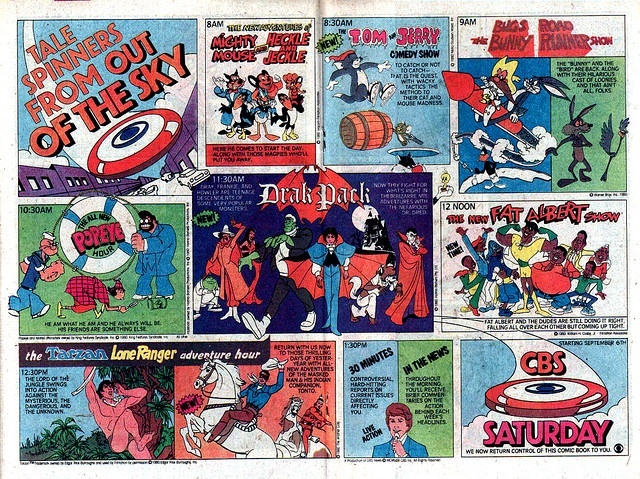 CBS were looking to hook audiences with rapid fire cartoons mostly of the super hero genre. Many of these characters faded into oblivion but some bring back fond memories. 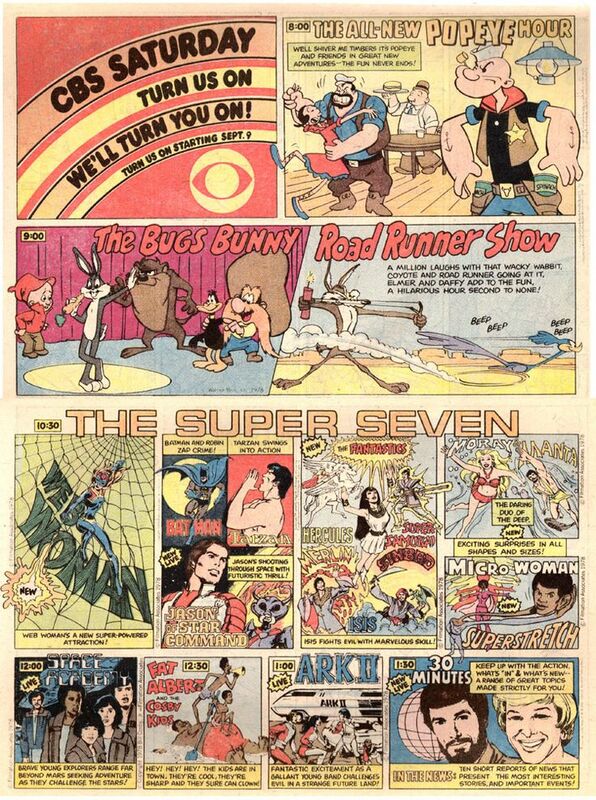 The Super Seven didnt go away easily as CBS threw whatever they could at the screen in the early days of the Saturday Morning cartoon era. Many of these shows did not have that magic that made many legendary moments in kids memories but they did exist! We could not make this stuff up! 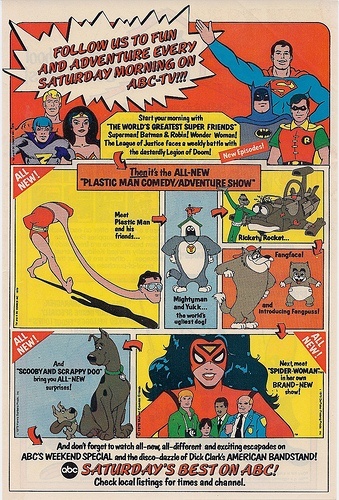 NBC fought back with such luminaries as the Fantastic Four, Godzilla, Yogis Space Race and Jana of The Jungle..
ABC how ever was always my favorite destination with SUPERFRIENDS, Plastic Man, Spider Woman and Scooby Doo! Many shows went on to have long histories with Saturday Mornings Like Bugs Bunny, Tom and Jerry, Fat Albert and Popeye. 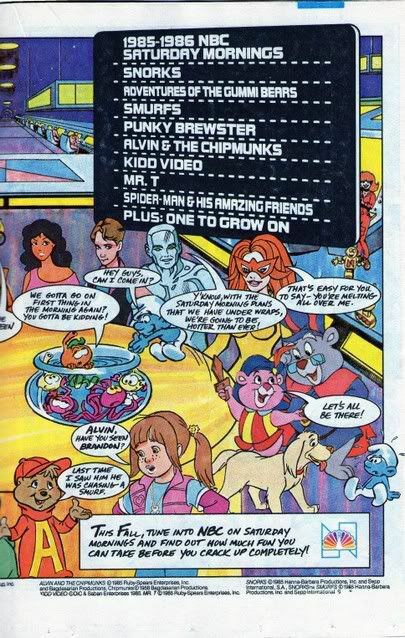 Some new shows were added to the line ups with similar results like Drak Pack and Mighty Mouse/Heckle and Jeckle. Trolkins, Tarzan, The Lone Ranger, and Kwicky Koala and a fan favorite BLACKSTAR joined the CBS team alongside the usual suspects!! 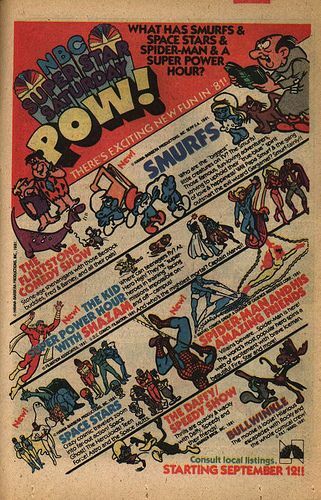 There was still reliance on tried and true classics like The Looney Tunes gang, The Flintstones, and the Power House Smurfs franchise! Shows like Shazam had reached the end of its life expectancy and was mercifully put down once and for all. New comers like the Space Stars line of shows were on the revolving door of the NBC line up, and one of the shortest lived cartoon blocks ever! 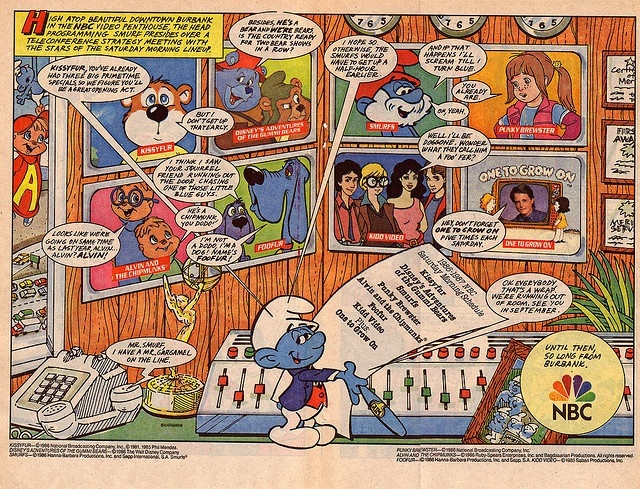 NBC exclusively hung its hat on the power of their 3 apples high blue little friends The Smurfs which would be its Saturday Morning cash cow for years during the red hot era of the Saturday Morning battle ground. We were on the brink of the great Video game invasion as a game tactic from rival networks..first to the dance was Pac-Man! Video game related shows stole the airwaves. Pac Man was THE hot video game in arcades all across the world and his merchandise, cereals, pastas, and yes his cartoon shows were every where. PacMan was the precursor for many more video game cartoons later! Donkey Kong, Dragons Lair and Q-Bert joined the ranks of the Saturday Morning Alumni! 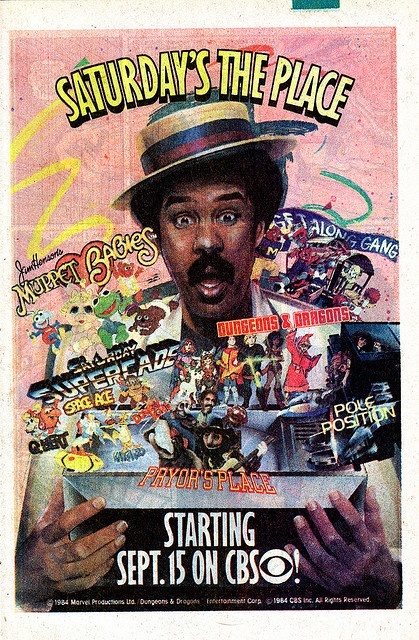 Pole Position and the iconic Dungeons and Dragons cartoon exploded to the air as CBS boasted the best Saturday Morning line up in my opinion! NBC was not far behind. We were in the prime of Saturday morning and it was heavenly! 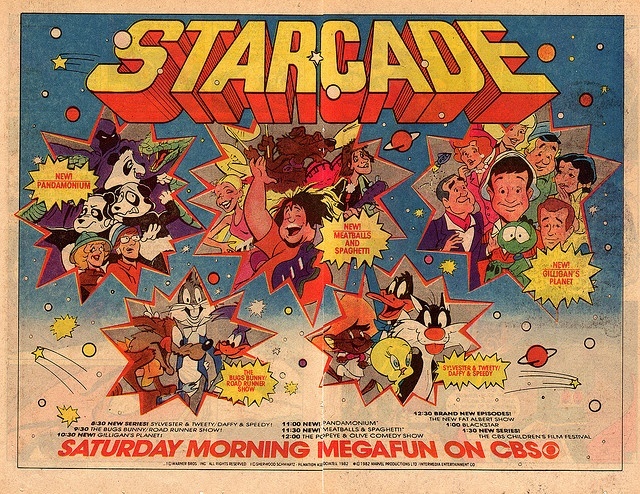 CGI heavily influenced the genre and set lists like Saturday Supercade boasted some new CGI tweeks into the cartoon world! From Richard Pryor to the WWF SuperStars of Wrestling led by Hulk Hogan muscled their way into the line up as well! Seemed Saturdays were the place to be for the stars and hot properties of the 80s! 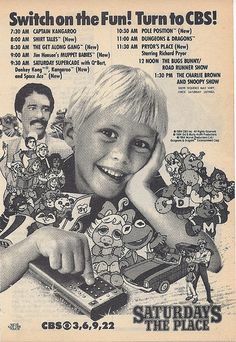 NBC’s line ups were strong as well with the anchor being the mega popular Smurfs NBC pulled out Disney properties like The Adventures Of The Gummy Bears , and long time contenders like Alvin and The Chipmunks consistently pulled in devoted viewers weekly! Alvin and The Chipmunks returned to glory by introducing the Chipette’s a move that breathed new life into the franchise! 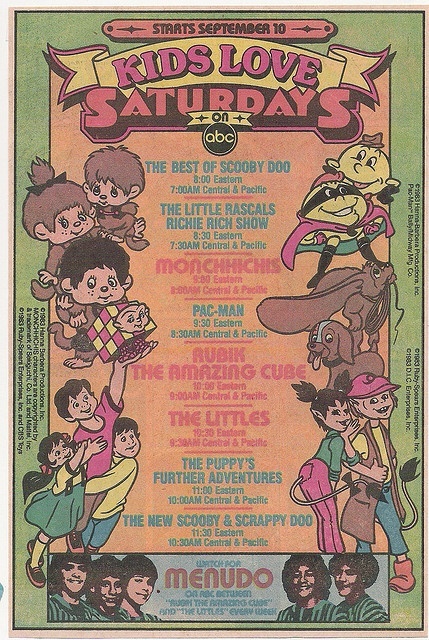 Saturday Mornings were the life force for kids during this day! Of course no better place for advertisers to ply their trade at the very lucrative minds of the 80s child. Enjoy some of the better commercials from the year 1988! Live action began to rear its head again on the cartoon heavy rotation this time in a big way as Pee Wees Play House became a sleeper hit and is fondly remembered for its iconic main star Pee Wee Herman and its groundbreaking humor that not only had the kids busting a gut but had the adults chuckle along with the hidden humor! Still resting its laurels on the success of the Smurfs, Saturday Mornings were beginning to show obvious dents in the armor content wise. While many of the video game properties featured on the old SuperCade line up had long since disappeared into obscurity new Nintendo driven cartoons like Super Mario Super Show and Captain N The Games Master arrived on the air. 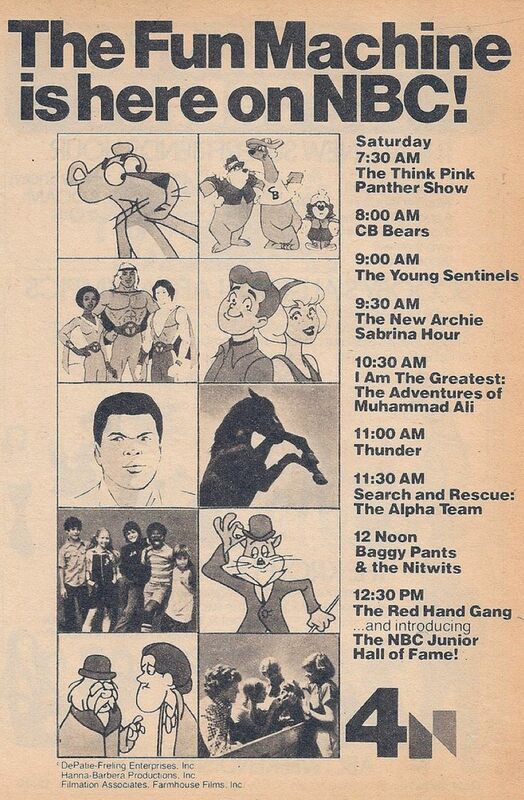 However the golden age of Cartoons was ominiously close as very few new additions to network line ups were added. As the 80s drew to a close an new competitor in the Saturday Morning race entered the Network fray FOX! 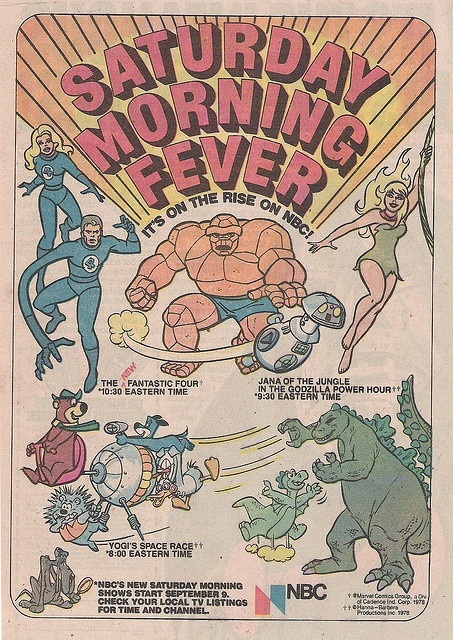 FOX boasted a comic book fan books dream roster of comic book related cartoons just as comics were entering its hot streak. Spider-Man, X-Men, Batman Beyond, and Static Shock landed on the morning line ups with a great audience to follow! Would this be the savior to our Saturday Morning blues? 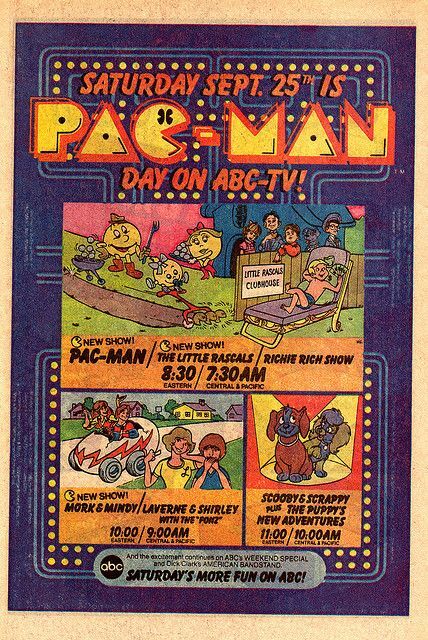 ABC in an effort to fend off the competition decided it would go heavy on Disney related shows with its One Saturday Morning line up! NBC however would launch a trend that would lay waste to the joys of Saturday morning by adding live action sitcom based teen shows and even news related adult programs like TODAY to the line ups. As fondly remembered as Saved By The Bell was it was the Harbinger and Grim Reaper to Saturday Morning Cartoons as we knew it..CBS went on to cancel kids programming in favor of sports related live action shows and news programming. By The 2000s Networks like ABC went on to feature heavily live action shows like Hannah Montana, Lizzie McGuire , and That’s So Raven. 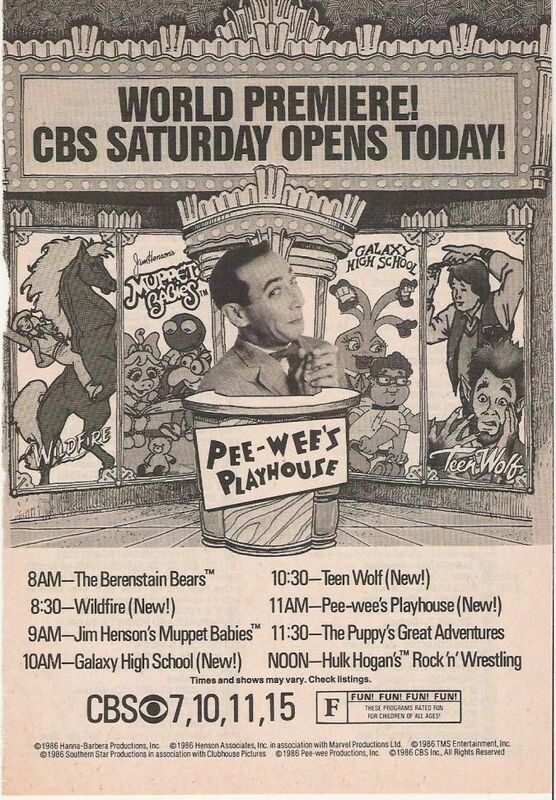 Most networks were exclusive to live action and the cartoon rotation that was the epicenter to every 80s kids Saturday Morning drifted into complete obscurity..
With streaming video applications such as Netflix and Hulu we can revisit some of the great Saturday Morning memories. I look back and feel bad for kids growing up in today’s era as they will never appreciate the joys of what cartoons could have on a child’s mind and imagination! I will always treasure the memories and look back at my Saturdays curled up on my couch or in my room watching this legendary moment in pop culture history..and look on in wonder..
Hero’s back to the iso chambers..this transmission is about to end..get ready for our next adventure..
Satellite EXTRA! : We arent done yet! Watch this amazing retrospective YOUTUBE series which covers the Rise and Fall of Saturday morning cartoons in a fantastic manner! A MUST watch for Nostalgia folks like us! Like this post? Why not leave a comment or talk with me directly on Twitter @Charlton_Hero . Join the conversation using #SuperHeroSatellite. Paul as always my friend..I appreciate your support. Longbox Graveyard is a favorite destination of mine as well so I truly appreciate your words of recommendation. We have a job to do and that tell our unique stories..if others follow along with us for the ride then its a big plus! 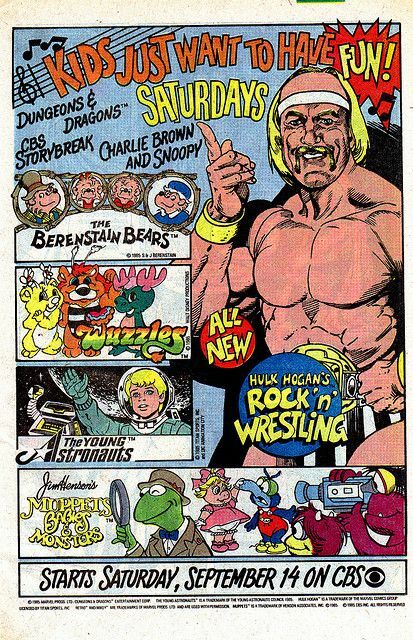 This brings back a ton of pleasant memories, though I have to admit I never knew that there was a Muhammad Ali cartoon (or The Young Sentinels, for that matter). I know the Ali show caught me by surprise too! How is that show not better known? 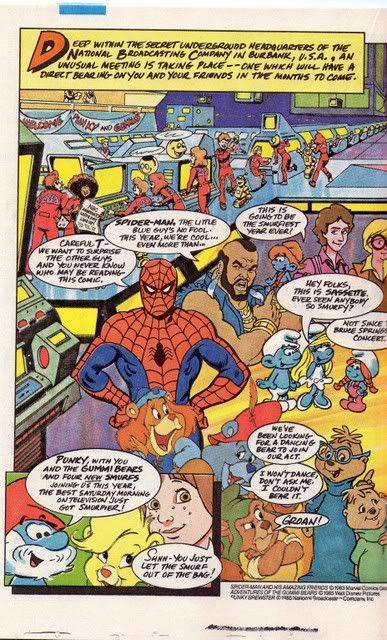 Oh, and I voted 80’s for my favorite era for cartoons. Tough call, but I’d say 1980-1984 (though 1979-1986 was pretty great overall is my favorite time – Star Blazers, Thundarr, Tarzan, Superfriends, Cosby Kids, Spider-Man and His Amzing Friends, etc. whew! I think 1994-1996 an 2006 were all excellent years, though there’s of course lots of great Hanna-Barbara and Filmation stuff from the 60’s and 70’s also. Agreed on the 80-84 era..that’s a purely magical time in cartoon history. So I would lay on the floor the week before with the TV Guide, staring at those ads above trying to plan which shows to watch. 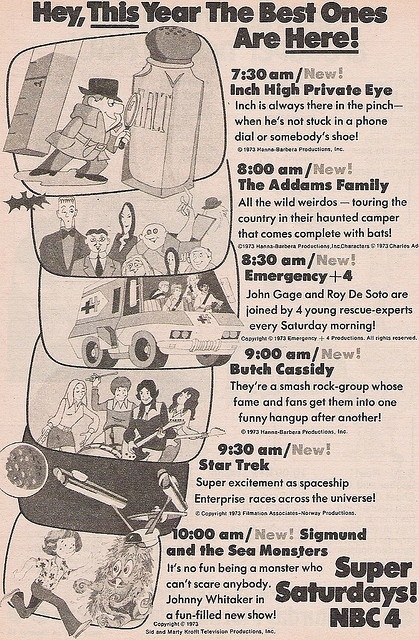 There was always competition for time slots. You had to be careful because if you picked the wrong show then you would miss the beginning of the first crucial episode of a better show on another channel. And it might be months of rotation before they got back around to it. I dug the real adventure stories the most. Filmation’s Tarzan and Flash Gordon were my favorites. Kids today with multiple 24 hour-a-day cartoon channels and on-demand cartoon content just don’t understand the struggle we had. Thank you so much for compiling these. I think I’m going to sit with my 11 year old this weekend and talk about “the good old days” and get his thoughts on which one’s he would have picked. I know Mike this was truly the Good Ole Days..I loved Saturday Mornings..and many shows are as clear in my mind as the day I watched them . I love this post and I put a ton of time into it..so I am glad you enjoyed it. I just wish some of the gosh darn YouTube videos would stay up a little longer!! Yeah, that drives me crazy about YouTube!